Registered nurses assess, plan, provide and evaluate preventative, curative and rehabilitative care for patients, clients and residents in a wide variety of settings. They treat patients and provide advice and emotional support to them and to their families. Some educate patients, as well as the public, about medical conditions. There are many nursing specialties, including critical care, addiction, oncology, neonatology, geriatrics and pediatrics. supervise enrolled nurses and other hospital staff. Why did you choose nursing? It started when I was 14 and my grandfather was 113 years old. There was a nurse that lived next door who would visit the elderly. She helped my grandfather from getting bedsores, and showed real love and care towards him. It was then that I knew. What training did you undergo? I did a Diploma in General Nursing Science, Community, Psychiatry and Midwifery. This was a four-year diploma with practical work. Describe a typical day on the job I work in a general ward with a mix of medical and psychiatric patients. In the mornings the night staff hand over to the day shift, then we check medication. Breakfast is issued, followed by the dispensing of medication to patients. The Sister then completes reports on the management of the patients. Doctors come in during the day and I do rounds with them and take orders on each patient. Nurses continue doing regular observations (blood pressure, etc). I deal with admission, transfers and discharge of patients. It’s a full 12-hour day! Describe your take on a ‘good’ nurse? You need to be down to earth and care about people; it is about caring, understanding and love. What do you enjoy most about your work? I love it when patients smile and say thank you when they feel better and are going home happy. Do you have any dislikes? Dealing with difficult patients – psychiatric patients, for example. It is not easy. Has there been a highlight in your career? I was still a student and it was my first delivery. I prepared everything and was telling the mother to push, and as she was pushing, so was I! I became hypoglycaemic and fainted. The doctor had to give me glucose to restore my blood sugar so I could continue. I finally helped her give birth to a healthy baby boy – I was so happy. I will never forget that experience. What are your future goals? I plan to study further to become an educator and train nurses. I would like to share my knowledge. What advice would you give to someone starting out in nursing? Don’t take up nursing because of the money. Nurse because you love it! A registered nurse may choose to obtain a Bachelor of Nursing degree, which involves theoretical training at a university and clinical training at an approved training hospital or other training institution. Another option is to obtain a Nursing Diploma from a college. It is highly important to be sure that the institution and the course are both approved by the Nursing Council. Registered nurses who receive their Bachelor of Nursing degree, as opposed to a diploma, have better chances for advancement in the field. 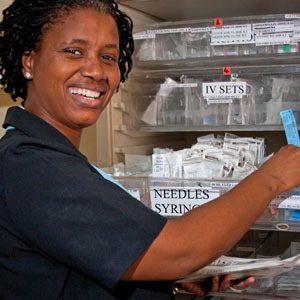 Once qualified, nurses must register with the South African Nursing Council in order to practice legally. Enrolled nursing auxiliaries can follow a certificate course at approved training hospitals, old-age homes and clinics.